Lightweight and easy to handle with multiple friction grooves for superior control, the Hunt'n Fisch Knife was designed by an expert bowhunter and outdoorsman. The knife features a flat grind blade made from stainless steel that holds a good edge and is easy to re-sharpen. It also boasts a laminated G10 handle with an attractive pattern as well as a comfortable grip and scales that are secured to the full tang by three large rivets. A leather sheath with a basket weave pattern is also included that can be mounted horizontally on your belt for a left or right hand-carry option. 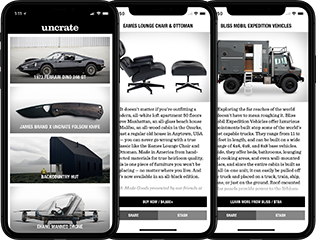 As seen in Uncrate Issue 03. Length: 7.25" / Blade Length: 2.9" / Weight: 3.6 oz.